There’s something special about the simplicity of some VR games. While I enjoy diving into a massive and engaging experience with complex interactions and controls – such as piloting a ship in a dogfight from EVE: Valkyrie – sometimes it’s nice to play something that, while simpler in terms of controls, still provides a robust gaming experience. Bazaar from Temple Gates Games is a bright and colorful game about exploring a mystical maze. You spend your time riding through a flooded Arabian-themed city atop a magic carpet and when you’re not busy humming songs from Aladdin in your head, you’ll be busy evading aggressive crocodiles and catching fish. The entire game is controlled through nothing but head tracking and focusing your gaze on areas of the environment. While it might sound simplistic at first, clever design choices make it extremely engaging. 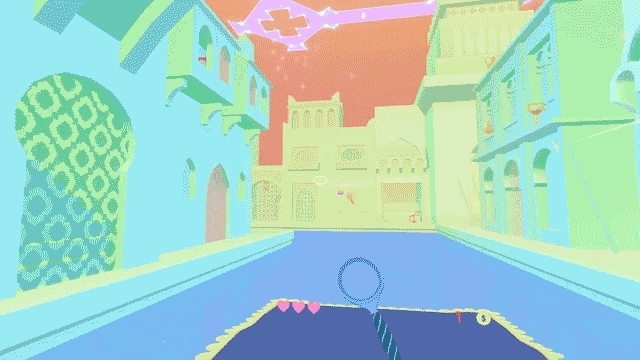 Once you take some time to dive into the wonderful and wacky world of Bazaar, you’ll quickly see why it won $50,000 in the Oculus Mobile VR Jam earlier this year. The fundamental driving force of the game is your magic carpet. It’s always moving forward in a straight line. You can speed up or slow down depending on where you’re looking and at each intersection you just turn your head to turn the carpet. Everything in the game is controlled by your gaze, in fact. Your inventory, your items, gold coins you collect out of the air and from windows, fish you catch for food in the water – everything. That being said, I’d highly recommend playing this game either in a swivel chair or while standing. You’ll have to constantly whip around to see all directions easily. As you explore each section of the city, you’ll start to slowly unlock more and more elements of the gameplay. For example, in the first section, there isn’t much need for a crossbow or shield since it’s mostly devoid of hostile creatures. You spend the first few areas just collecting money and picking up items to get your bearings. Then, you’ll start running into poison dart traps, cobras, crocodiles, and eventually even a merchant from which to buy special items. The $10 price tag might seem a bit steep, but you can get more than your money’s worth if you take the time to dig into Bazaar and really explore each section of the city. Once you beat it, though, there isn’t a whole lot of replay value after you collect most of the items. Some alternate game modes or even just palette swapping some of the buildings could help make it feel fresh and varied in some places. The developers seem to be working to update Bazaar on a relatively consistent basis. The most recent large update includes optional gamepad support as well as new items and enemies, for example. Temple Gates Games also told UploadVR they hope to soon add more music, more tutorials to explain features, and more advanced monsters. The bright art style can cause some minor eye strain after an extended period of play and some people may notice a bit of uneasiness when the carpet quickly turns a corner on occasion. I’d also like to specifically commend Josquin des Pres, who created the music that’s used in Bazaar. It not only fits the tone and setting of the game perfectly, but it adds even more personality to a game that’s already begging to be explored. When such a simple mechanic, such as the movement of your head, is used to build the entire game from the ground up, everything works so much more effortlessly. 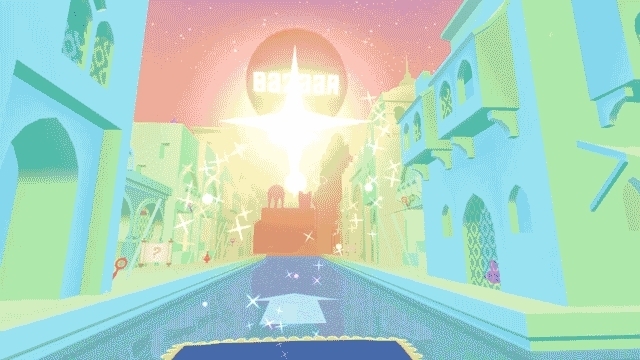 Some VR games can feel like they were adapted from traditional control schemes and just have head tracking tacked on top as a feature, but it’s clear Bazaar wouldn’t exist if it weren’t for VR technology. It is one of the most well-rounded games in the store, both easy-to-pickup and fun to play for extended periods.